The owner was stressed out and the dog was freaking out, Captan said. I figured, Why dont I train those people? He hired his friend Megan Blake to write a program and teach the class with three other instructors and her dog Super Smiley. An actress, animal trainer and lifestyle coach, Blake also has a psychology degree from Georgia Tech. With more dogs racking up air miles these days, it makes sense to take obedience school to a new level, said Heidi Heubner, who directs volunteers, including airport therapy dogs, at Los Angeles World Airport. There are no numbers on how many pets are taking to the skies, but they have become essential parts of a growing number of families and traveling with them for work and play is becoming more common, said Kim Cunningham, a spokesman for the International Pet and Animal Transportation Association in Texas. It will vary by airline, but theres always a fee for cabin pets those under 20 pounds that have to stay in carriers under the seat during a flight. Workings dogs or trained service animals (most airlines also allow psychiatric and emotional support animals, too) fly free, but owners must give the airline documentation and advance notice. The animals sit at their owners feet during flights. The class doesnt address cargo pets. With more dogs racking up air miles these days, it makes sense to take obedience school to a new level, said Heidi Heubner, who directs volunteers, including airport therapy dogs, at Los Angeles World Airport. ASSOCIATED PRESS Enlarge The class is using the same studio where parts of Bridesmaids, Kill Bill and 500 other movies were made. 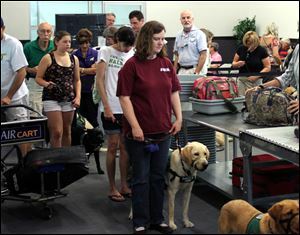 Workings dogs or trained service animals (most airlines also allow psychiatric and emotional support animals, too) fly free, but owners must give the airline documentation and advance notice. The animals sit at their owners feet during flights. The class doesnt address cargo pets. The class is using the same studio where parts of Bridesmaids, Kill Bill and 500 other movies were made. 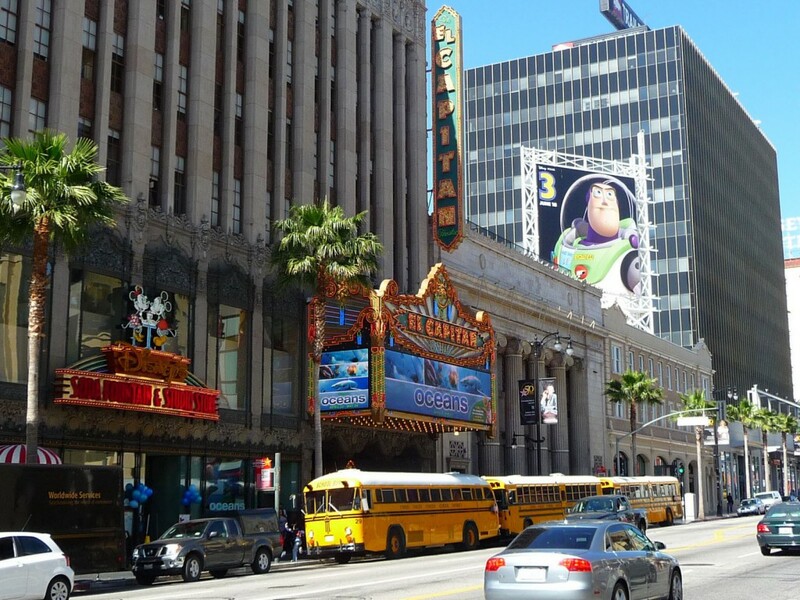 Television scenes from NCIS, Modern Family and The Newsroom have also been filmed there. Last year, Air Hollywood conducted a test class with 60 puppies from Guide Dogs for the Blind. Some of the handlers were more nervous than the dogs because they dont like to fly, said Rick Wilcox, who oversees puppy-training in Southern California. It was amazing how realistic it was. Two things are deliberately absent in the simulated airport: the smell of jet fuel and a change in cabin pressure that makes your ears pop. Captan opened his studio about six months before Sept. 11. On Sept. 12, the phone started ringing because airports were locked down and movie and television studios couldnt shoot scenes they needed. Matt Souder/AP The Air Hollywood K9 school includes a mock security check in. The Hollywood studios maintain they have little advance notice of dates, that slots change suddenly, and that many movies dont fulfill their potential because they are intentionally programmed in close proximity to each other. And even though the studios now conduct marketing alongside China Film, the murkiness of release dates makes it is difficult to build sustained promotional campaigns, which in turn makes media-buying tricky. SEE ALSO: Chinese Hit Tiny Times Taps Internet Generation Via Audience Research Moreover, the Film Bureau still appears to be operating blackout periods, in which foreign films are not allowed to open. While this years summer blackout was comparatively limited, the studios expect October and December to be largely out of bounds for their films. December sees the release of at least three big Chinese films Police Story 2013, starring Jackie Chan in the sixth film of the franchise; Feng Xiaogangs Personal Tailor; and The Monkey King with Chow Yun-fat. The job of the studios Beijing offices remains, crucially, a lobbying effort, trying to persuade China Film and the Film Bureau which pictures to pick for import. And although the quota has expanded from 20 revenue-sharing movies per year to 34, with the additional titles being in 3D or Imax formats, gaining entry into China does not appear to be getting much easier. China Film seems to be intent on cherrypicking movies that do well at the U.S. box office rather than choosing evenhandedly among all of the studios offerings. And Chinas government organizations arent the only ones that have been dogging the studios. In April 2012, the U.S. Securities and Exchange Commission sent a letter of inquiry to 20th Century Fox, DreamWorks Animation and Disney regarding their dealings with the Chinese government. The SEC was probing the possibility of bribes paid to Chinese officials by the Hollywood companies looking to secure distribution.